Aircel in which Malaysia’s Maxis Communications Berhad holds a 74 per cent stake, has launched a range of BlackBerry smart phones and services for enterprise and individual customers on its network. With this launch, Aircel become the most recent entrant in the BlackBerry league and will directly compete with other services providers like Airtel, Vodafone, MTNL, BSNL, Idea, BPL, Reliance Communications and Tata Teleservices who already provide BlackBerry services to their subscribers. Aircel will leverage its strong local presence and Redington’s retail distribution channel to offer BlackBerry services across major cities in India including Mumbai, Delhi, Kolkata, Chennai, Andhra Pradesh, Karnataka and the rest of Tamil Nadu state. Aircel Blackberry portfolio includes phones like BlackBerry Bold 9000, BlackBerry Curve8900, BlackBerry Curve 8310 and BlackBerry Pearl 8110. “We have gained significant momentum in expanding our operations in India and the launch of the BlackBerry solution is of strategic importance for Aircel’s growth. With the availability of a wide range of BlackBerry smartphones on our network, our customers can find the right model for their work and personal needs”, said Aircel COO Mr.Gurdeep Singh. Aircel will offer BlackBerry Enterprise Server to corporate customers that manage their own email servers. 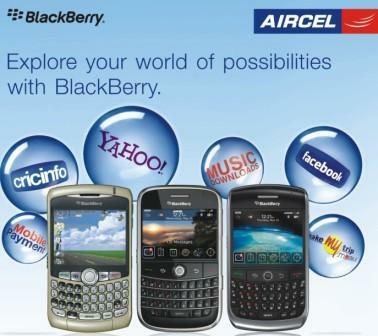 Aircel will also offer BlackBerry Internet Service, which is designed for smaller businesses and individuals. It allows customers to access up to 10 supported corporate and personal email accounts (including most popular ISP email accounts) from a BlackBerry smartphone. IDEA MOBILE’S OFFER INFO,JUST SMS AWAY! Aircel increases the validity of the 21 rate cutter from 30 days to 90 days..
so now we get all local calls at 75ps-50ps-25ps and S.T.D @ Flat 75ps for 3 months with recharge of 21 Rs..